With the aim of providing high quality human resources to Vietnam in the context of international integration, Vietnam National University of Agriculture collaborated with two prestigious universities (among top 100 universities in the world) in the United States, namely University of California, Davis and University of Wisconsin–Madison to develop two advanced education programs including Bachelor of Crop Science (introduced in 2006) and Bachelor of Agribusiness Management (introduced in 2008). During the implementation of these two new education programs, VNUA always pays attention to the self-assessment to keep improving education quality and meet the increasing demand for high quality human resources. After more than 10 years since the introduction of these programs, VNUA carried out its self-evaluation of the two education programs according to the assessment criteria of the ASEAN University Network – Quality Assurance (AUN_QA). From 21 to 23 March, 2018, the evaluation team of AUN-QA visited VNUA to assess these two education programs. During three working days focusing on interviewing related stakeholders, reviewing documents and visiting VNUA’s facilities, the AUN-QA team evaluated the two education programs on 11 standards and 50 criteria covering key aspects such as expected learning outcomes, program structure and content, human resources (lecturers and supporting staff), quality of students, activities to support students, facilities, quality assurance system for ensuring internal quality and output quality of the students. Based on the assessment results, the AUN-QA assessment team pointed out strengths and weaknesses of the two education programs with the aim of further improving training quality. 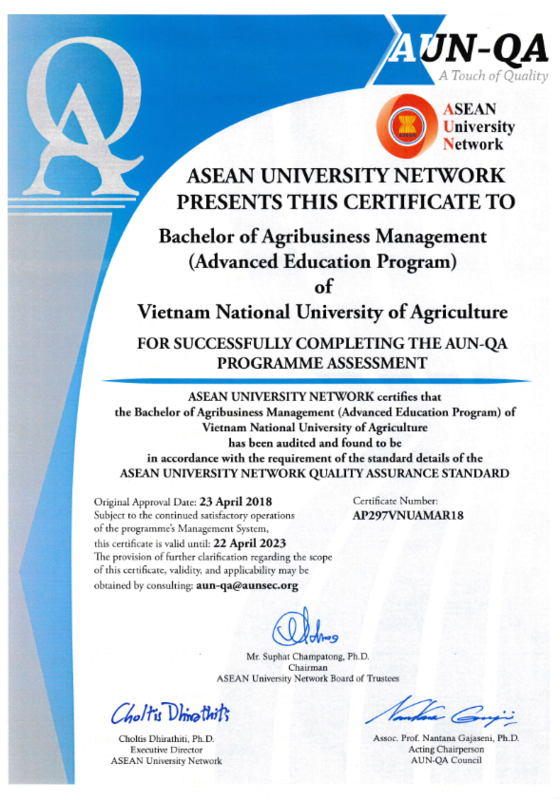 On August 16, 2018, VNUA officially received the certificates for two advanced education programs: Bachelor of Crop Science and Bachelor of Agribusiness Management for successfully completing the AUN-QA program assessment. 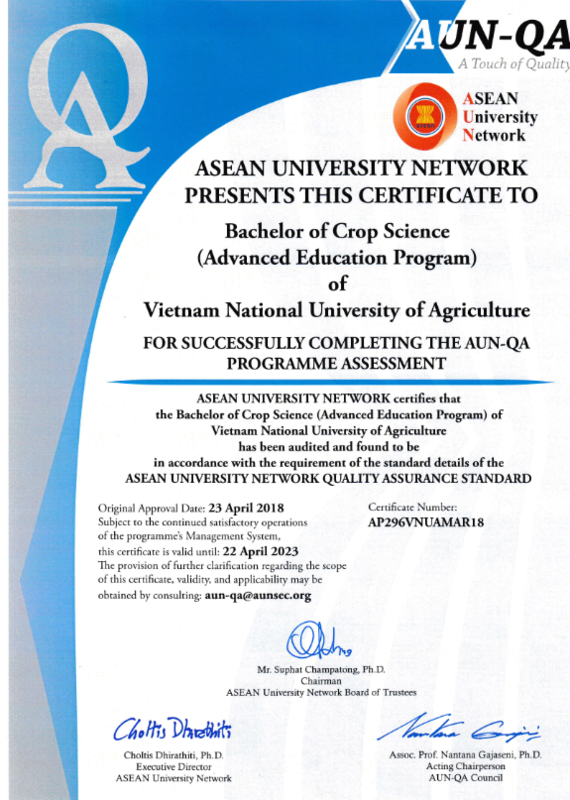 Meeting the requirements of the standard details of the ASEAN University Network Quality Assurance Standard provides students of the two programs with great training and work opportunities in Vietnam as well as in other parts of the globe. That is also a big motivation for Vietnam National University of Agriculture to continuously improve its quality, thereby affirming its prestige and position in education as well as international integration.